In 1963, William Grant and Sons built the Girvan distillery for the production of grain whisky. Converted from an old WWII munitions factory in only nine months, the distillery now has a staggering production capacity of 103 million litres annually. Some of the efficiency in the production comes from the original patent still, which operates distillation in a vacuum chamber. And now a little physics lesson: a vacuum chamber requires a lower temperature to boil spirits, this results in a more efficient alcohol production compared to standard practice. Additionally the use of five column stills (one at 90ft high situated outside the distillery) also benefits mass produce. From a still output of 94% ABV, the alcohol is brought down to 74.5% ABV prior to maturation. Before 1984 corn grain was used, but today wheat grain is used instead. The majority of Girvan whisky production goes into making blended whisky, however today’s whisky being tasted is a single grain variety. Whisky drinkers will be more familiar with the term “single malt”; this Girvan Single Grain whisky comes solely from the Girvan distillery. 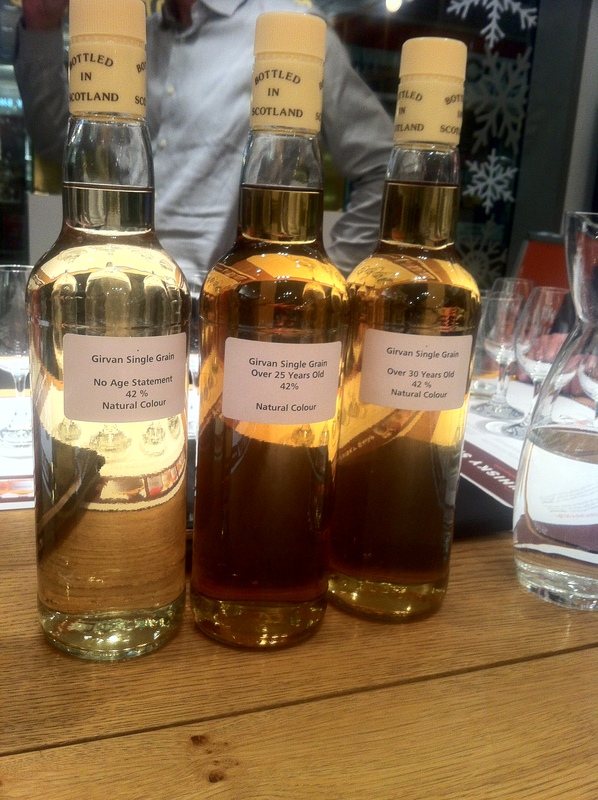 On the table are three different Girvan Single Grain Whiskies: No Age Statement, 25 year old and 30 year old – although only the 25 year old has been commercially bottled. This is a non-commercial bottle; the NAS is blend of young whiskies with 42% ABV. The nose is floral, lightly vanilla with mild citrus. The palate is surprisingly very light, soft and smooth with lemon taste. The finish is quick, creamy and leaves a nice tingling residue. The whisky will be priced around £75 when released. This single grain whisky is a selection of 25 year old casks bottled at 42%. Recently released in November 2013, this is Girvan’s first single grain 25yo commercial bottle. The nose gives a lovely vanilla and honey aroma with a hint of floral note. The palate is still gently mild, but not as gentle as the NAS though and you can start to pick out other flavours including banana, vanilla, honey and lemon. With a soft gentle bitter, the finish is creamy and have the same pleasant tingle residue as the NAS. This whisky is priced about £250. This non-commercial single grain whisky is a selection of 30 year old casks bottled at 42%. We did say Girvan use wheat for distillation; however the Girvan 30yo pre-dates the use of wheat and hence is made from corn instead. Unlike its younger siblings, the aroma is more reminiscent of single malt whisky with honey, vanilla, ripe lemons, elderflower and skewed bananas. The palate is a little dry, spirited and very slightly bitter; the finish is similar to the 25yo, creamy with a gentle tingling sensation. Expect to pay a price tag of close to £400 per a bottle when release. whiskytale: It’s like the time you grew your first tree in the garden. In your mind is a picture of the beautiful shady tree you always wanted. But on that day, it is nothing more than just soil over the spot where you planted the seed. A few weeks later and the seedling begin to sprout. You almost feel like a proud parent seeing your effort come to fruition; it’s still early days though. A year later and you have a sapling. It is beginning to show features, but most of the growth effort is focus in the development of its roots. This is the stage the Girvan No Age Statement has reached. The whisky is young and it’s grabbing characteristics from the cask, but this process has only just begun. You can pick up subtle flavours from the wood, such as the gentleness of the aroma and the softness of the palate. The moment is similar to when the juvenile sapling first displays the shape of its leaves, differentiating it from other saplings. Fast forward good many years, and your tree has finally reached the stages of maturity. The tree is at a steady pace of growth, and is strong and resistant enough to fend off its rivals. This is the Girvan 25yo whisky. It has absorbed the key essence from the wood giving it a lovely aroma and palate. The whisky is well balanced too where the desired smell and flavours are more pronounced than any less desirable characteristics. The trouble with trees though, you don’t know how long they will live. It is extremely difficult to judge the Girvan 30yo for similar reasons, as it is to even begin to predict how a Girvan 50yo single grain whisky would taste. However, I will confidently say that the Girvan 30yo whisky is still in its mature stage. It is still grabbing beautiful flavours from the wood, but where the 25yo gives you slightly younger flavours, the 30yo has ripened.